The first phase of the first Global Legal Hackathon (GLH) was held February 23-25, 2018. David Fisher, organizer of the event and founder of the technological and legal company Integra Ledger, estimates that the GLH will have a great impact. He hasn’t spoken too soon; global participation in the GLH nearly matched that of an earlier event organized by NASA, and it has been considered the largest hackathon organized to date. For 54 hours, more than 40 cities across six continents participated simultaneously. The teams were made up of engineers, jurists, lawyers, and people in business who all worked toward a common goal: to lay the foundations for legal projects that can improve legal work or access to legal information through an app, program, or software. The Universidad Francisco de Vitoria (UFV), in Pozuelo de Alarcón (Madrid), hosted the eleven teams competing from Spain. The Madrid hackathon organization made advisors in law and business available to all the teams, and they helped throughout the competition. Of course, at MeaningCloud we wanted to take part in this unique opportunity for Legal Tech. Technological innovation is continually advancing and affects all fields of knowledge. The legal field is one of them. 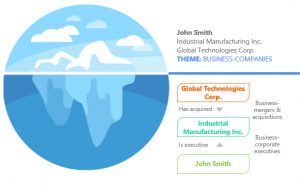 From MeaningCloud, we made our tools, applications, and corporate software available to the participants—free of charge—so that the teams could work more effectively. 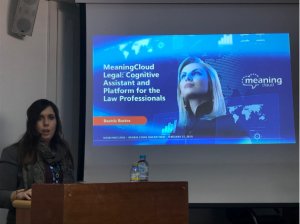 Our MeaningCloud team presented an assistant and a platform to facilitate the deep understanding of legal texts using semantic networks for law professionals. For example, we focused on analyzing the reasons that appellants usually bring a cassation appeal to the Administrative Bench of the Supreme Court for a specific legal case. The cassation appeal is the step in the procedural order to review the interpretative criteria used by the lower courts. For each reason, we extracted the requested articles. Since the grounds of the appeal must also be related to one of the reasons legally assessed in article 88 of the Law 29/1998 of July 13, governing Administrative Jurisdiction, we classified them according to four fundamentals: defect of the Jurisdictional exercise (abuse or excess), inadequacy of the procedure, breach of essential forms, and normative infringement. This analysis is completed with the court’s response to each of the motives and the appeal, so we can know what motivations should be invoked for a cassation appeal to be considered. This is one possible application of our Deep Semantic Analytics tools, which are based on applying advanced Natural Language Processing technology to reach a deep understanding of complex documents. These tools are able, among other things, to make a very precise categorization at the fragment level and to extract semantic relationships between the entities and concepts that appear in the text, in order to generate a semantic graph that represents the meaning of the document. We plan to release a product with this type of solution for the legal sector, so it can have automatic tools that really understand legal documents in scenarios like due diligence, analysis of contracts, eDiscovery, etc. in a fast, scalable, and economical way. In a few weeks, on April 21st, the final will take place in New York City, which has more than 177,000 active lawyers (according to data compiled by the American Bar Association). This is certainly a great opportunity to sow the seeds of the promising Legal Tech solutions presented. We need to build a better legal industry. We have to follow the example of other industries, where technology did not make them smaller but bigger and better. We are on the verge of a small revolution, and at MeaningCloud we are very excited to be part of this event. Written by Beatriz Bustos, computational linguist at MeaningCloud. Translator and Computational Linguist at MeaningCloud. Passionate about Social Media and Spanish language.